Corunna have been one of the top teams in the state over the last number of years. Bryan Heid has been coaching the boys team at Corunna High School for the past 14 years and he was recently named the MITCA Cross Country Coach of the Year. Among Heid's accomplishments while at the helm for Corunna are taking five straight conference and regional championships (2014 to 2018), as well as earning five top 10 finishes at State's during those years (including one victory). MileSplit had an opportunity to talk to Coach Heid about receiving this prestigious award and about his experiences at Corunna. Congratulations on winning the MITCA Cross Country Coach of the Year award. What does receiving this honor mean to you? It is great for our school and our program to get honored for the hard work that we put in. The Corunna squad had a great season - can you take us through some of the highlights. We tend to train pretty hard through September and round into racing form in October. We did exactly that this year as we had a great October by winning our conference, county, Greater Lansing Invitational and Regional meets. The Regional meet was our high point as we went 1, 2, 3, 5 and 16 to capture the championship with 27 points. We were unable to keep the momentum going at the state meet, but we still finished 6th in a deep field. Do you have a specific coaching philosophy? What does your instructional routine look like throughout the season? Can you describe the segments that you put your athletes through (for example, base building, peaking for State's, etc.). We have two goals: be the best you and help others be the best they can be. If we accomplish those things then it is a tremendous success. We run the PAAVO program - we build a base all summer and into the first couple of weeks of the season. We purposely have a stretch with no meets when we introduce intervals to retrain the body to race faster. This is a shock that cannot be done while also doing races. We later have another stretch with no races when we introduce some speed workouts on the track to give the runners that last kick or extra gear. The final weeks of the season are spent making sure the body and mind are healthy and fresh. We reserve the all-out days for racing. We try to mitigate the emotional drain as well and just have fun reaping the rewards of the hard training. Who were your coaching mentors that inspired you? What are some of the things that you took from them that you've implemented into your own coaching? I was blessed to learn from two amazing men in John Fattal and Gordie Aldrich when I was hired at Corunna. They truly loved the sport and had incredible passion. They did it the right way. There were no shortcuts, no 'almost good enough'. They went all in and I respect that and try to implement that in my own coaching. 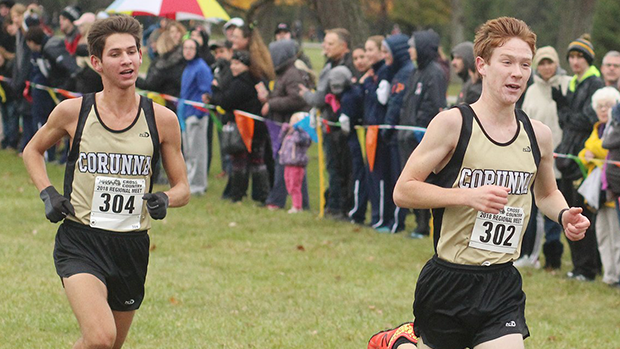 What can we expect from next year's Corunna team? Who are some of the athletes to look out for? We graduated a lot of guys this past year so we have many opportunities for guys to step up. It is always great to see guys that have been working hard for two or three years get the opportunity to race varsity at big meets. We had two guys this year in Will Strauch and Jonah Ochodnicky who put in so many miles and helped out our team in a great number of ways get a chance to race some big meets and overcome some mental barriers. It was a treat to be a part of that process and culmination. Next year Evan Roka will be one of the elite runners in the state. He has improved every year and looks to make that next step. Mason Warner gained some valuable experience and will also look to put his name in with the big dogs. We have some in-coming guys that will be called upon to contribute as freshmen - Logan Roka and Nicholas Strauch, while some seniors will need to step up, such as Zach Gooding, Drew Nickels and Dillion Baumchen. What advice would you give to a young coach who is new to high school cross country? Do not make winning races the goal. Celebrate every kid's pr's. Make sure to have time for the kids to share their stories about races and practice runs. It is amazing how much you can learn from a kid telling about their race / run. You feel like you were there and it helps the rest of the team make better connections and it gives everyone a voice. Every kid is an expert on what happened on their run. Love the journey.